Are you building a new home or perhaps renovating your current one? In either case, at some point, a major question will arise: What kind of flooring will you have? There are a bevy of options to choose from when it comes time to pick your new flooring: carpet, hardwood, laminate . . .
Of course, within the choices you have, one sticks out among the rest: tile. Tile is an attractive and practical option for any room in any home. And with its longevity and durability, you can enjoy this stunning flooring option for years to come. Now, even once you’ve decided that tile is the flooring option for you, you still have some choices to make concerning what KIND of tile you’ll pick: marble, quartz, slate? While those and other materials are certainly great options, they can’t hold a candle to limestone when it comes to comfort and hygiene. What Makes Limestone So Comfortable? 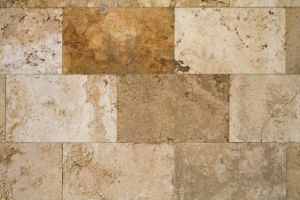 Though limestone can be used for tile flooring, unlike many other tile options, limestone is quite soft, providing a comfortable feeling underfoot. Because of the heavy-duty usage those two rooms will be subjected to (not to mention the likelihood of dropping something heavy or sharp therein), you should avoid putting limestone flooring in them. After all, with a relatively soft flooring material, those rooms could quickly reduce your limestone flooring to a cracked, busted MESS. Still, though, in most other rooms in your home, limestone provides a comfortable yet secure flooring, making it ideal for the homeowner who prefers functionality as well as aesthetics. And What Makes Limestone So Hygienic? Unlike carpeting, whose fibrous design can lock in dirt, dust, and other harmful particulates, limestone tile is quite easy to keep clean. This design is a definite benefit for anyone who is prone to allergies and other issues that result from exposure to these kinds of particulates. And so forth. Your health is important, and it’s vital to ensure that your home inspires only the best health possible. And with limestone flooring, you can be sure to maintain a hygienic, healthy home easily! If you decide that limestone is the right kind of flooring for your new or improved home, then don’t hesitate to call on Kennedy Tile & Marble Inc. for quality limestone. Our tile and marble professionals have over thirty years of experience both selling and cutting limestone for flooring purposes, so you can rely on us to provide you with top-shelf material cut to meet your exact needs!